So Jason Bay is about to become a Met again, provided no necessary appendages fall off during his physical next week. Yup, we said again. 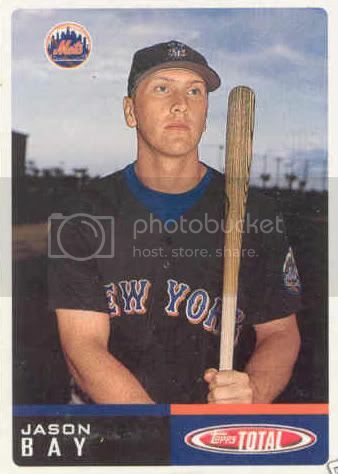 It might surprise some who assume his baseball journey began in Pittsburgh, but Bay actually played all of 69 games in the Mets’ organization for St. Lucie in the Florida State League during the 2002 season, thus the baseball card of the surprisingly jacked-looking 23-year-old to the left there. That was after Omar Minaya, then the Expos’ general manager, traded him and Jimmy (Don’t Call Me Pedro) Serrano to the Mets that March for future PawSox legend Lou Collier. That considered, I now look forward to Minaya someday overpaying a limping, 38-year-old Grady Sizemore and a scar-elbowed Cliff Lee. Frankly, it’s inevitable. Four months after acquiring Bay, the Mets were apparently so enamored with the young outfielder that they dealt him at the July 31 deadline along with two pitchers/roster scraps to the Padres for pitchers Steve Reed and Jason Middlebrooks. You can look them up on baseball-reference if you want. Not surprisingly, Bay never cracked Baseball America’s prospect lists until 2004, when he was rated third in the Pirates organization and 74th overall. As for how this plays in the present . . . I suppose I might be regarded as one of the charter members of the Don’t Pay Bay Brigade, and that’s probably a fair perception. While I agree that he’ll continue to hit around .270-30-110 for another year or two before sliding into his decline phase, I have hard time believing that a player who is adequate at best defensively and who whiffed 162 times last season will be anything close to a $16 million-per-year player at the end of his contract. It’s not like I’m always in favor of being conservative financially — I’d be absolutely fine with paying Joe Mauer at least $250 million dollars as a free agent provided he remains healthy — but in Bay’s case, I think it the Red Sox approach was wise. He’ll be worth the money in 2010 and maybe even ’11. But beyond that, good luck, Omar. It’s a contract the Mets will eventually regret, but if anyone is going to get overpaid, I’m glad it’s someone like Bay. Too bad it didn’t work out here. I’ll always adore Manny Ramirez, but the 2008 Red Sox season could have gone either way in the tense days after his insubordinate and unseemly departure. If not for Bay’s immediate contributions — he tripled and scored the winning run in the 12th inning of his Boston debut — it might not have been such a sweet September for the Sox. With some, the so-happy-to-be-here intro might have come across as disingenuous. With Bay, a swell guy by all accounts, it seemed genuine, sincere and even charming. Given his performance and personality, he immediately made it easy to get over Manny on the field and off the field, and in retrospect, that’s a feat that should make him proud. The Sox have had few players who have been easier to cheer. Too bad he couldn’t have stayed longer. To some right now, it might appear that Bay is just another greedy have-bat, will-travel mercenary who chose cash over sentiment. But it seems to me he ended up as a Met not because they threw the biggest pile of cash his way, but because someone in his camp misread or was deceived by the market. The Mariners and Angels were expected to have significant interest; in both cases, it was apparently lukewarm at best, and it must have staggered the Trail, B.C., native when Seattle turned to flammable Milton Bradley instead. It was particularly telling that Bay’s agent, Joe Urbon, reportedly came back to the Sox, ballcap in hand, after the Mets made their best pitch and tried to rekindle talks; I suspect that longstanding four-year, $60 million offer was much more appealing yesterday than it was the day the Sox offered it. When the Sox, justifiably wary of the luxury tax, stuck to their budget — we’ll see if the Yankees stick to their so-called budget now that Matt Holliday is the last chunk of chum in the water — he made the choice to go to the only place that really seemed to covet him. Even though he’ll probably come to realize, in the off-chance that he doesn’t already, that Boston was the best fit in every meaningful way beyond financial considerations, I doubt he’ll have much regret about being a Met as long as Fred Wilpon’s checks continue to clear. The National League, supposedly more of a fastball league, should suit Bay well. I actually never quite understood how Bay was as good as he was — or to reword that, I admired that he was so productive for someone who had such blatant flaws as a hitter. Joe Castiglione could have hollered from the broadcast booth, “Hey, J-Bay, here comes a slider! The pitcher! The one on the mound! He’s throwing a slider! Again, a slider coming your way, J-Bay!” and Bay still probably would have missed it by half a foot. But the man can mash even an excellent fastball, and the Sox will miss his ability to hit power pitching. If the Mets have any sense and want to get the most out of their investment, they’ll move in that left field fence at Citi Field next offseason, for reasons obviously beneficial to Bay’s offense and defense. Somewhere, David Wright nods his head in agreement. Finally, in the spirit of fair warning, if anyone suggests in the comments that letting Bay go means Mike Lowell and Jacoby Ellsbury can now platoon in left field, there’s gonna be a brawl around here.